Jenny of ELEFANTZ: What do I stitch when I'm not stitching my own designs? What do I stitch when I'm not stitching my own designs? I'm really time poor when it comes to stitching things 'just for pleasure'. Designing is a full time job, and as fun as that sounds to most of you it's actually a really intense and time consuming occupation. But when I find a small pocket of time between commitments and deadlines and blogging and tutorials and sketching and pattern writing and pattern formatting and 'stitching' (which takes the least amount of all my time, can you believe it!?) I try to make something just for me. No instructions to take notes on, no mind boggling dramas when my notes go missing (usually because I forgot to take them...oops), no questioning myself over pattern layouts, thread choices, backgrounds...you get the point? When I was burrowing through my infamous UFO box last week I came across a few orphan projects I'd made from the designs of good friends of mine, girls who always inspire me - but being time poor they never made it past the embroidery phase. However, I do have some that are finished, and even though most were stitched years ago I wanted to 'show off' the beauty and creativity of my friends. Naturally they're all made in 'my' style and colour choices, but the designs themselves are the real stars! I've put links to the designs above the photos (if they are still available) in case you are inspired to make one too! Allie Hartom of Allie-oops Designs was one of my very first overseas (USA) blogging friends back in 2008. Over the years we just got closer and closer and she became my go-to prayer partner every time life crowds in on either of us. That's a blessing I do not take lightly. God sealed our friendship and we know we're blessed because of it. 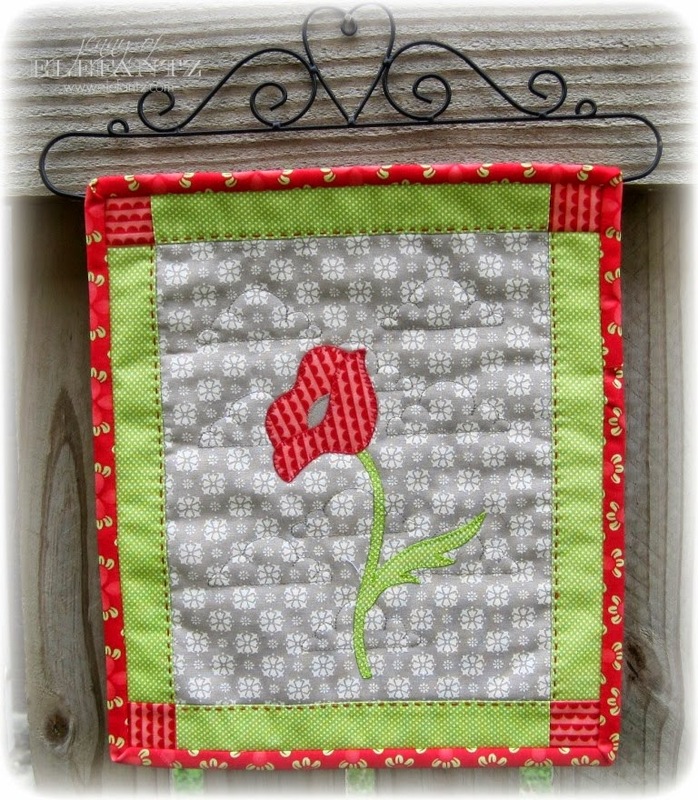 When I saw her 'Pam's Poppy' appliqued mini quilt a couple of years ago I had the fabric chosen and the threads ready the same day! Vicki Tucek is also one of my longest blogging buddies, in fact it was Vicki who back in 2009 encouraged me to approach some Aussie magazines with my early designs for publishing - and bless her, that started a whole career! 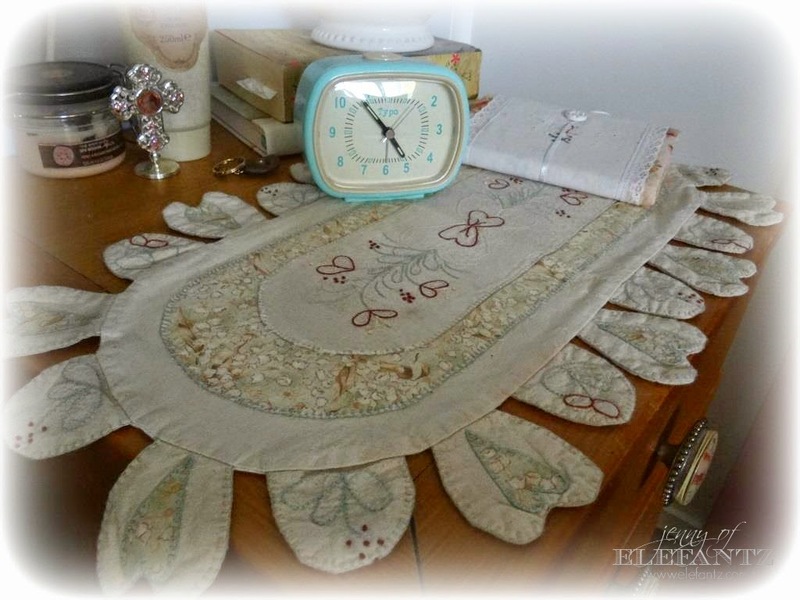 Before we 'met' I'd fallen in love with this table runner design of hers and loved every minute of the stitching. It rarely leaves my bedside table. We met back in early 2009 when a comment was left on my blog by 'Vicki Tucek' and I immediately emailed to ask if she was the Vicki Tucek, the designer? !...she was, and mutual admiration grew from there. Vikki Collumbine is another precious friend, and just this year she also became my sister-in-Christ! Oh happy days! 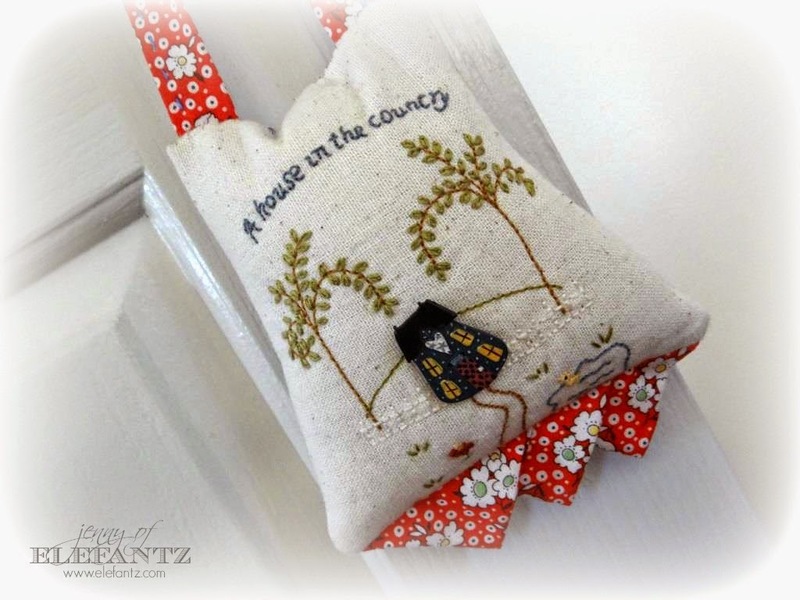 A few years back when we lived in the outback I made one of Vikki's cute stitcheries into a little door hanger (I love door hangers and have them everywhere!). It always makes me smile. 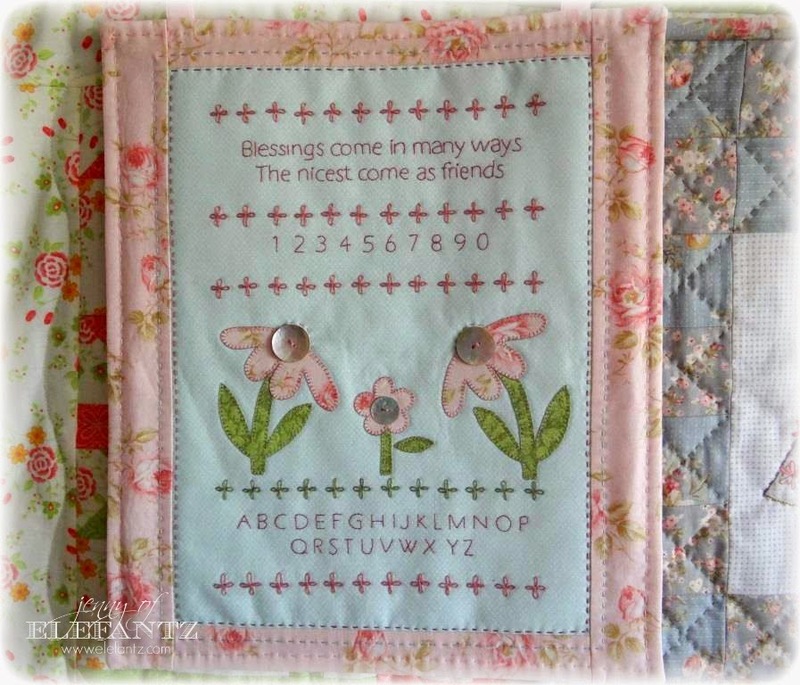 A couple of years ago she had this gorgeous sampler published in Country Threads magazine, and before I closed the final page on that magazine ideas for different colours and mother of pearl buttons were filling my mind. Michelle (Shell) May is another of my 'across the pond' buddies in the USA, someone I admire and respect and who has been a treasure with her time and friendship towards me. We both believe a 'face to face' day is coming regardless of the thousands and thousands of miles of ocean between us! Though known for her gorgeous Folk Art Fusion wool designs, she has also designed stitcheries in the past and this is one I made back in 2012. Dawn Hay and I were introduced through Vicki Tucek in 2009, and she is a real sweetheart! A homeschool veteran like myself and Allie Hartom, Dawn designs with a gentle touch that always makes you feel good. In March we finally met 'for real' down south in Melbourne at 'Lets Get Stitched' and as soon as I saw the project Dawn had for the girls it sped very quickly to the top of my 'gotta-make-this' list! The stitchery on the pocket of her Preston Bag is as cute as can be and I had the whole bag made within a few days. The pattern for Dawn's "Preston Bag" is HERE. Brenda Riddle is one of my favourite fabric designers and her pretty prints have brought a number of my stitcheries to life! She's also got a heart for Jesus that shines through her gentle and humble nature, and I am blessed to call her a friend. 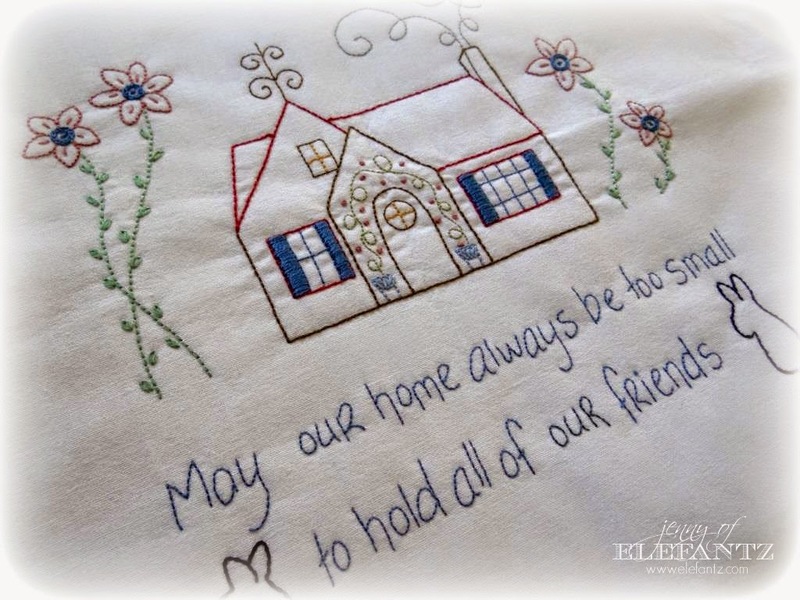 In 2012 I fell in love with Bren's "Betsy's Closet In Stitches" pattern and even gathered a large online group together for a year to stitch it. 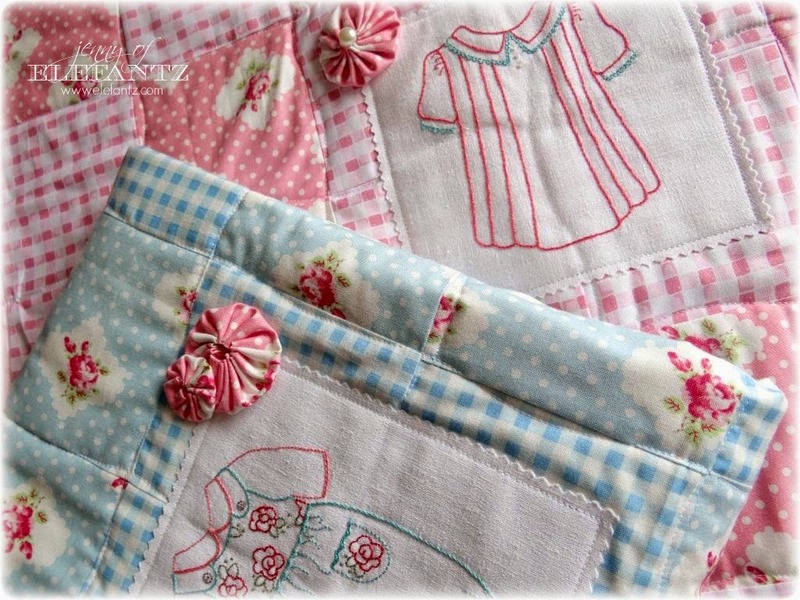 I used two of the blocks to make memory quilts for a dear friend's little girls. My friend Pam died suddenly mid-2012 leaving 4 and 6 year old daughters, two teenage boys, and a devoted husband behind. In response to my request Pam's hubby posted me a box of Pam's favourite clothes and I used them to make quilt backings for the girls. On the front of the quilts I wanted pretty, joyful colours to compliment the Betsy's Closet blocks, because I knew Pam would love that for them. She was a girly girl herself, you see. Anyhow, the girls loved the quilts, and especially the little Betsy blocks. 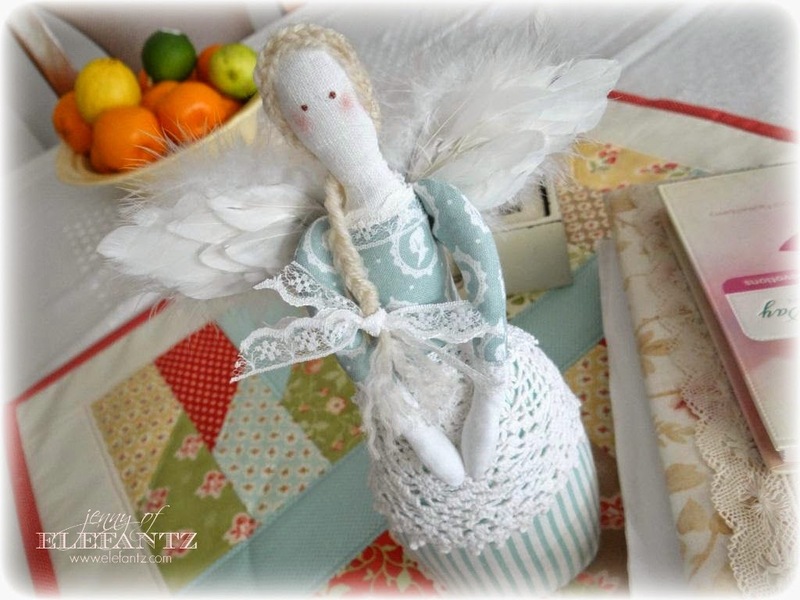 My final 'show & tell' is a pincushion angel I made from a design by Kerryanne English of Shabby Art Boutique! 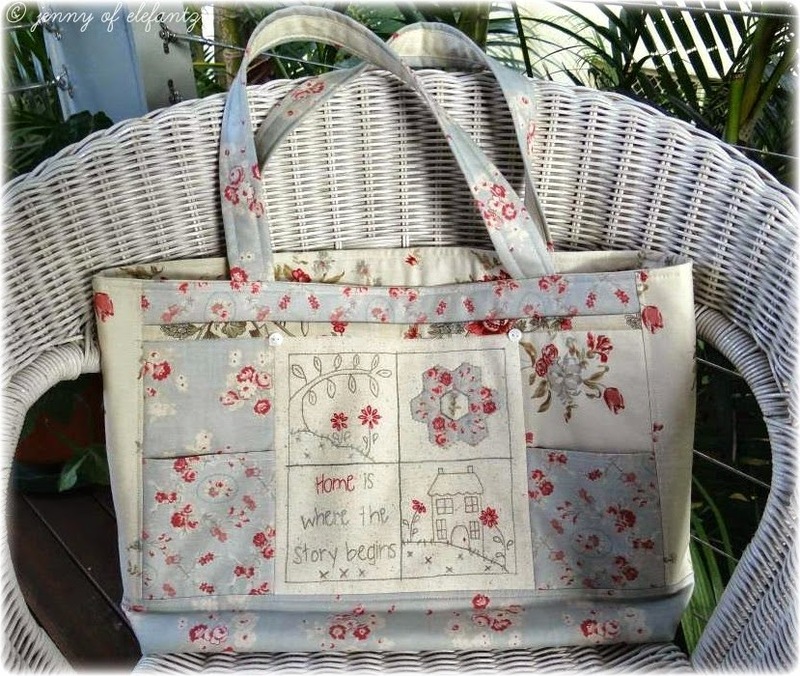 Kerryanne is a lover of all things shabby chic and that's what first put her on my radar. Over the past couple of years I have been featured in her wonderful Shabbylicious magazine a couple of times and in the process have gotten to know her as a friend She's a very genuine lady, honest and generous with her time and talent - in fact right now she has the sweetest Christmas planner as a free download on her blog. Kerryanne's pattern for the angel pincushion is HERE. So there you have it - this is what I stitch when I'm not stitching an Elefantz design. It's been nice sharing these gals with you today. I hope you go visit them and say hi. They're all incredibly sweet! I've really enjoyed this wonderful post. As always,your stitching is exquisite. Awesome friends are a blessing! You have the best besties! Lovely post, Jenny. There are so many gorgeous projects out there. Everything looks wonderful. I know and love all these gals - love how you put your Jenny-spin on all the projects, dear heart! Very nice "tell it all".you have some wonderful and very talented friends. Absolutely delightful post. I 'met' most of these ladies at approximately the same time and have forever admired their talents. Thank you for sharing links and projects. Have a great day!! I love the Betsy's Closet in Stitches. I have been looking for a stitchery design like that on and off for years. This may be my quite time project after the Christmas making chaos is over while I wait for the baby I am expecting in January. So very glad you shared it. It is so lovely when the Lord blesses us with precious sisters in Christ with whom we can share our interests and passions and lives. It is so beautiful that you are so aware and grateful for that blessing in your life.